I have been critical of the quality of opposition which we have seen from some members over recent weeks. It is an art of which I have some personal knowledge as I spent 3 years in opposition in the 90's attempting to hold the ruling Lib Dem/Labour Administration to account. I was recently sorting through some old files and came across this ageing edition of the Leigh Times which was published in December 1995. 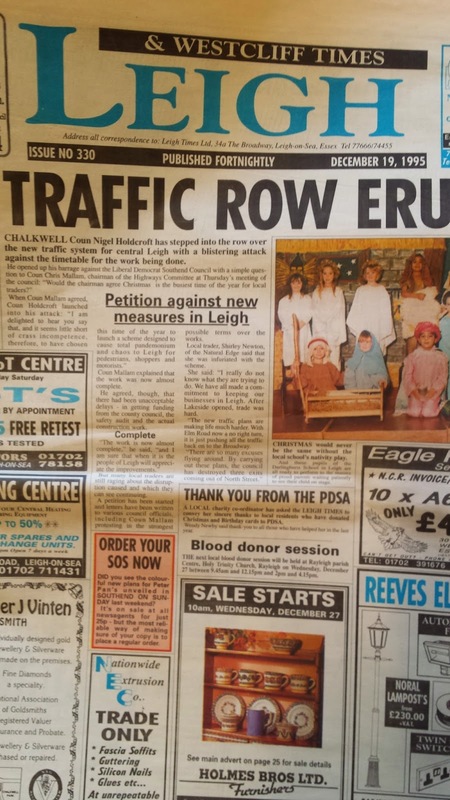 I was agitated about the crass decision to undertake some major and disrutive roadworks in Leigh Broadway causing chaos in the the pre Xmas rush. I think a question to the then Lib Dem Chair of Highways asking "Would the Chairman agree Christmas is the busiest time of the year for local traders?" was suitably succinct! My colleagues Mark Flewitt and James Courtenay appear to have attracted the ire of some opposition councillors by suggesting that by voting against the budget they were also voting against the bits of the budget they liked. We have heard some tosh on the primary role of opposition being to oppose and not suggest alternatives. Ignoring the fact that in an authority with such a small majority it seems strange that they should not try to take advantage of this situation to press for changes they support. It also fails to differentiate between the budget and other policy decisions. There are many decisions which we have decided to implement where there is a decision as to whether or not to take action and it is reasonable for opposition groups to oppose and/or attempt to hold the administration to account even if they do not provide viable alternatives. However with the budget we are all under a legal obligation to set a balanced budget so decisions have to be made. If opposition groups don't like what we are proposing they can raise alternative suggestions either through the scrutiny process or formally by way of amendments to the budget. If they are voted down then they have tried to influence the decision and can stand by their alternative plan. However where they have failed to make any alternative proposals and then vote against the budget they are also voting against all elements of that budget. It is the only sensible interpretation of the situation as if they wanted to be more selective they have had the chance to do so by way of amendment. Accordingly it is quite fair to say that all those opposition members who voted against our proposals were voting against increased expenditure on school improvement, regeneration etc. as well as our proposals for LED street lighting, intervention along Victoria Avenue and the rest. They simply can't have it both ways. One of the most challenging but enjoyable elements of the budget debate for any Leader is the obligation to sum up the debate and to respond to the issues raised by other members. The opportunity to review both their contributions and my response is now easy to access via Southend Council's website so you don't have to rely on my account. My impression on the evening was that in general terms the contribution by the opposition parties was disappointing and in some cases extremely weak. Of the leaders Lib Dem Graham Longley, who can normally be relied on to come up with some stunt or gimmick, seemed out of sorts. He complained of smoke and mirrors and an apparent failure to provide detail yet under my leadership we have gone to great lengths to provide as much detail as is realistic bearing in mind the proposals are in draft and can effect employees, and certainly more than most authorities. Bizarrely he also commented on our failure to raise council tax but then indicated that he was not proposing doing so. Ian Gilbert for Labour did his usual act of bemoaning the austerity measures with a convenient memory loss on Labour's involvement in the financial difficulties we have faced, unreasonably criticised service level performance and said that he couldn't waste officer time in working with them to put forward alternative budget proposals. This is ridiculous as many other opposition groups around the country manage to prepare alternatives and as I mentioned he could simply have suggested a higher council tax rise and then spent the additional income. If he is so sure the public backs his stance on budget cuts then why would he be afraid of a referendum on a council tax rise of perhaps 5%! As for Independent Party leader Martin Terry he rambled for a considerable time and once again demonstrated his misunderstanding of local government finance - something he freely admitted to a scrutiny meeting a couple of years ago. Of the others I particularly enjoyed the contributions from Steve Aylen who called for the establishment of a members cost cutting committee even though he had failed to attend the all member pre budget sessions to discuss the same issue and Ric Morgan, who unlike last year actually managed to stay in the chamber for the entire debate and cast a vote. So in conclusion all 3 opposition leaders failed to propose any alternatives, amendments or variations to our proposals but all indicated that they would be voting against the budget ignoring our mutual obligation to set a balanced budget. Indeed if we had all followed this dynamic lead we would have set no budget and would have had to come back a week later to have the same debate on the same proposals without opposition amendments and in the meantime the delivery of council bills would have been delayed with a potential loss of income of £100,000- £200,000. They may think that it is clever politics but not as I know it. Last Thursday saw the presentation to council of my last budget as Leader. For the first time in history this was available both live and later through the webcast accessible via the Council's web site. My speech was as follows: I think that it is appropriate that I start this my 7th and final budget speech as Leader by briefing reflecting on the journey which this Council has travelled over the last few years. Having fought long and hard to regain our independence from 2 tier Essex the reality is that we struggled to cope with the challenge of newly returned services such as adult social care and in those first few years too many of our services were performing below acceptable standards and left the authority at very real risk of central government intervention. With the arrival of a new and collaborative Chief Executive, swiftly followed by a revitalised senior management team working in conjunction with an ambitious and focussed succession of Conservative administrations the organisation has been transformed. Service levels have been driven up resulting in a plethora of awards and other recognition to include of course Council of the Year, and we have established a reputation both in central government and elsewhere as an organisation which delivers our objectives and does so in a timely and cost effective way. Let us not forget that this has been achieved in circumstances where there has been a constant increase in the demand for our services, to include burgeoning pre and early school numbers and an ageing population with our over 65s anticipated to increase by over 10% in the next 3 years. This progress has also been achieved with a succession of small majorities in this chamber and indeed for one year a minority administration. It has also been achieved through a financial squeeze at a level unknown to our predecessors, firstly due to the census undercount, then through the need to invest in services to drive improvement and more recently to deal with the austerity measures. In the last 8 years, and to include these proposals we will have delivered £79M of annual revenue savings. Let me spell that out. If we had not delivered these savings we would be spending an extra £79M of council tax payers money this year and next year and every year into the future and if we wanted to reinstate those savings as part of this budget we would need a council tax rise of 129.6%. And yet even now we are able to bring forward a budget which does not decimate our core services and will have little adverse effect on our residents, but does include new investment in our priority areas which is only possible because of our good housekeeping skills. Some members of this chamber may claim a grasp of financial management but it is this administration which has not just talked the talk but has walked the walk to the direct benefit of our residents and it is relevant to note that once again we have had no amendments, variations or alternatives from any of the opposition groups either tonight or in the six and a half weeks since our draft budget proposals were published. These latest proposals direct the spending of over ½ a billion pounds during the next financial year to include £28M within the ring fenced Housing Revenue Account, £143M for schools, a capital budget of £137M over the next 4 years with a total gross revenue budget of approximately £419M. Our settlement from central government will reduce by 9.8% in the coming year. We are also faced with inevitable service pressures which require additional resources. This includes the demand on social care by our ageing population, the need to support our foster children to age 21 rather than 18, the additional cost of supporting the transition of residents with learning difficulties to adult social care, and notwithstanding our increased recycling levels, an increase in landfill tax. These pressures amount to £1.67M and when added to the effect of our reduced funding mean that we must find economies totalling just over £7.3M for the coming year. The detail of our proposals is set out in the papers before us but include a range of measures to increase income such as the expansion of our adoption service to other authorities, the creation of a new marriage room and the opening of the new Queensway car park; further restructures and efficiencies to include bereavement services and the post room; the financial return for some of the difficult decisions made during the last 12 months to include the restructure of libraries and youth service and the decision on Priory & Delaware, and a range of miscellaneous items such as the reduction in the size of cabinet, reduction in the LGA subscription and final savings from the car leasing scheme. I am pleased to confirm our intention to accept the government’s council tax freeze grant again this year meaning that we will have frozen our element of council tax bills for the third time in four years. Whilst statutory fees and charges will increase as dictated by central government and some social care charges are increasing to reflect demand I am delighted that this administration is proposing freezing car park charges for the 5th time in 6 years and also our leisure fees which not only supports our aspiration to encourage our residents to engage in sport and leisure activities but also acknowledges that in these hard economic times a further increase is at risk of deterring usage and resulting in a reduction in income. We are also freezing our cemetery and crematorium fees whilst still investing in a new cemetery. Our proposals will result in up to 49.5 full time equivalent job losses, which is not as bad as we had feared and because of our pro active policies only 23.5 of these posts are currently occupied which compares favourably with the 33 posts which we are currently holding vacant. With the continued use of our talent pool I am confident that as with the last couple of years the number of compulsory redundancies will be kept to a very small number. This not only recognises the personal distress of compulsory redundancy on the staff affected but also the high financial cost to the authority. Once again schools do well when compared with the rest of the public sector with an increase of approximately 2% per pupil in the Dedicated Schools Grant and big rises in the pupil premium meaning that income will rise overall by an average of 3% although slewed slightly to the advantage of those schools with greater numbers of children receiving the pupil premium. The ring fenced HRA does not have any financial affects on other council tax payers. After consultation and clarification on the latest convergence rules we believe that we should continue to work towards convergence but at the slowest realistic speed to acknowledge the ongoing financial challenge that many of our tenants face. Notwithstanding these difficult times we are bringing forward an exciting and imaginative capital programme proposing over £50M on new schemes over the next 4 years. This includes investment in the Airport Business Park, ICT investment to ensure the organisation can work ever more efficiently, a fund to intervene in Victoria Avenue, provision for the potential need for a new primary school in the town centre, the introduction of LED street lights to ensure that unlike some of our neighbours we keep our street lights on through the night but still deliver revenue savings, and a continuation of our policy to make proper investment in the maintenance of our roads and pavements enabling us to maintain a programme of resurfacing across the town and not just filling pot holes. Due to our previous good housekeeping we have healthy balances in our general and earmarked reserves allowing us to fund some short term and revenue growth items. This includes £200K for the next 3 years focussed on school improvement, and £100K for the next 2 years to support economic development. Some members of this chamber have criticised current borrowing levels. Council funding is based on the assumption and expectation that councils will fund an element of their capital expenditure by borrowing and as a result we have available to us the Public Works Loan Board which provides advantageous interest rates to local authorities. Like any family or business council borrowing needs to be considered on the basis of two primary criteria namely whether the proposed expenditure justifies the borrowing proposed and whether the cost of borrowing is prudent and sustainable. The level of borrowing which we have accumulated in this authority is best described as average when compared to similar authorities across the county. Our expert Head of Finance regards it as prudent affordable and sustainable, a view supported by our professional external auditors and whilst it has increased, this is significantly as a result of our predecessors reluctance to borrow to invest, resulting in deterioration in our infrastructure and assets which has had to be addressed. Excluding the HRA borrowing which is related primarily to the transfer of central government borrowing to local government and is payable from council house rents and not our general revenue account, the level of borrowing by the end of this year will amount to £172M. This will result in repayments during the current year of £13M of which £6M is the repayment of capital and only £7M interest. It is payable from a gross revenue budget of £400M so is equivalent to less than 1.8% of our relevant income or to put it in simple terms it is like a family on an income of £30K per annum having a mortgage liability of £45 per month. You cannot separate the cost of borrowing from the projects delivered. I continue to challenge those opposing current borrowing levels to spell out the schemes which we have funded in whole or in part by borrowing, and which they would not have not undertaken, so that we can see the interest saving this would have delivered. So let’s hear this detail tonight – it is time for you to put up or shut up and then to explain to your residents why you did not vote against those schemes you now oppose at the time. To reject a programme of controlled and reasonable borrowing in an authority such as ours which has limited income generating assets, would mean a lack of investment in roads, council buildings, ICT and spend to save projects as well leaving us unable to take advantage of match funding. It would represent a betrayal of the aspirations of our residents and represents the politics of the luddite in its worst form. Last year I spelt out a 5 point plan explaining how this Administration would deliver the significant and ongoing savings required whilst continuing to invest in services and meet increasing demand. The application of our plan has meant that we have been able to deliver a remarkably good and positive budget notwithstanding the ongoing challenges. The principles of the plan were 1. To rely on our highly skilled and committed workforce to deliver services in an ever more efficient and cost effective manner. This budget contains numerous examples whether by restructuring or the deletion of over 25 vacant posts 2. To pursue means of delivering our services more economically in partnership with other public bodies & services, the private sector and the voluntary sector – this is reflected in our decisions on the library service, Priory & Delaware and Saxon Lodge & Shelford. 3. To search out alternative methods of generating income from our assets and our services but in a way that stimulates growth and profitability from the services we provide well rather than penalizing our residents for those services they need to use – so we are developing trading income from telephony, educational supplies and aids and adaptations, increased income from our adoption service & new potential income streams from the proposed Airport Business Park and Seaway Car park whilst freezing car parking charges, leisure chares and crematorium charges. 4. To identify potential capital investment which is capable of delivering continuing revenue savings – this is demonstrated by the new ways of working, the jointly operated Forum and the ongoing investment in modern information technology 5. And by recognizing that our financial circumstances make it impossible to deliver universal and subsidised or free services to all, but rather that our target should be to ensure that the core services we provide are of good quality and value to those of our residents who need to rely on them, but free only to those who otherwise would be unable to afford them – this is the theme which undermines our approach to protecting and developing our core services. By focusing provision and activity in this way our remaining resources can be directed to maintaining and improving the environment and facilities available to our residents, businesses and visitors to encourage and stimulate both financial and emotional investment and regeneration in the Town and by abandoning those services which do not advance these aims or can be more effectively delivered by others. This is a budget which listens to our residents priorities, is based on sound Conservative value for money and common sense and leaves a town and council ready and prepared for the challenges still to come and accordingly I commend it to this chamber and formally moves its approval.